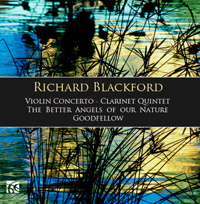 Description: Like our previous offerings of this composer's music (12Q065, 04N088, 02K102), this is a most appealing disc, with a varied program of thoroughly tonal works that mine a deep vein of romanticism. The violin concerto especially; the work is warmly romantic, particularly the gorgeous slow movement, based on a Russian Orthodox chant. The sonata-form first movement has traces of neoclassical Stravinsky, and the modal rondo-finale has Bartokian and folk-like elements treated in a way that recalls Vaughan Williams. The quintet, in a darker, somewhat more chromatic idiom, was inspired by Caradog Pritchard's novel Full Moon. While not programmatic, the characterful music clearly reflects the narrative of the young boy growing up in a poor district of Wales under circumstances that ultimately turn tragic. Tenderness, warmth and hardship, and the consoling hymns of the local chapel are all vividly portrayed. The quarter-hour oboe concerto takes its title from Lincoln's first Inaugural Address. The piece, in two movements separated by the bugle call 'taps', channels Vaughan Williams and Shostakovich in roughly equal measure in what is explicitly a plea for peace. A sombre introduction leads to increasingly furious agitation, and finally to the tranquility and hope suggested by the title. 'Goodfellow' is Shakespeare's Puck, portrayed in lively scherzi and dreamy, impressionistic episodes.